We are still working out a possible launch window for January 15th. Originally scheduled to fly was Perseus Columbia on a high performance flight, and an Artemis booster to test anti-zippering tech. Since the Aurora X5 booster “Firefly” is done, and ready for flight, I have decided to dump the Artemis mission, and go with Firefly. Firefly is already equipped with anti-zipper tech, so I can kill two birds with one stone here. Columbia is still a “go” as well. Aurora X5 Firefly on a launch pad test. The plan is to do one high performance flight with Columbia, and two flights with Firefly. Firefly will fly the camera and altimeter, and depending on the direction of the winds, I may go for the F35 motor flight as Firefly’s second mission! 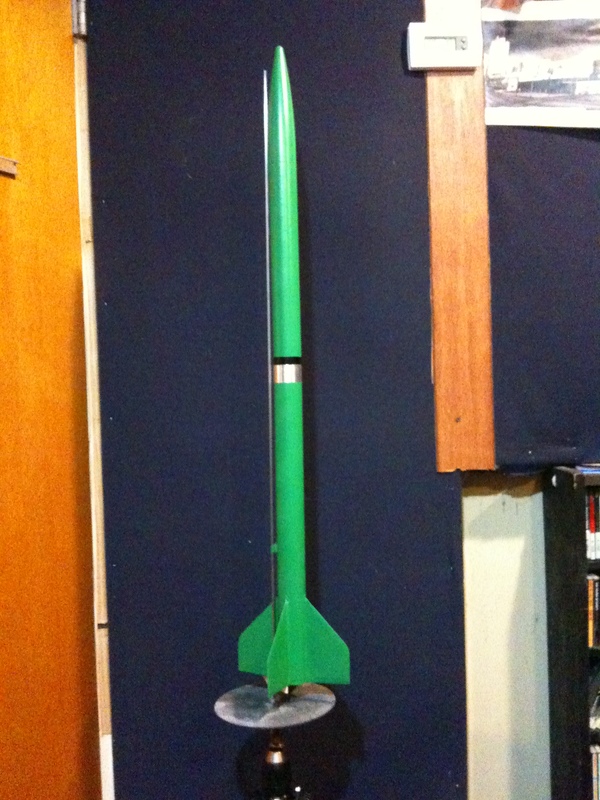 First launch will be on an E-18 motor. I may decide to work my way up to the F35 with an F24 flight in between — it just depends on how patient I will be in the cold. Hehe. This launch will be at the O’Reily field in Middlefield, OH. This will be my first club launch as VP of the MTMA rocketry club! More on that later!